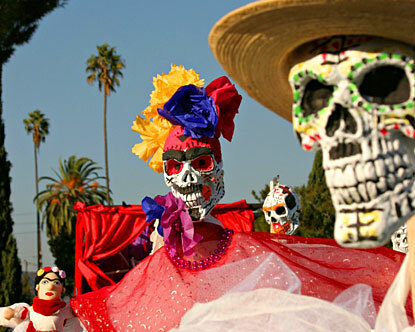 Having lived in Los Angeles for 28 years, this Mexican holiday, El Dia de los Mueros, was celebrated right along with our Hallowe’en, although they have completely different origins. Just today, a dear friend reported to me that she had visited Olvera Street for their Day of the Dead celebrations, and I had a moment of envy, and a flashback to the colorful carnival atmosphere, where death is celebrated and even sometimes mocked. El Dia de los Muertos occurs on November 2 in connection with the Catholic holidays of All Saints’ Day (November 1) and All Souls’ Day (November 2). Mexicans gather in families to celebrate and remember their loved ones who have died by bringing food, marigolds, candles, incense, photos and other memorabilia to an altar especially created for the occasion. Graves are visited, flowers placed, and even drink such as tequila is brought to the graveside. Skulls are a predominant emblem and show up in many varieties, even as small candies, shaped like Calaveras (skulls and skeletons.) All in all, it is colorful, and joyful, and reflects a sensibility towards death that is not usually found here. Greetings! This is my 1st comment here so I just wanted to give a fast shout out and say I genuinely enjoy reading by way of your posts. Can you suggest any other blogs that deal with the very same topics? Thanks for your time! Hello there! I can have sworn I’ve been to this blog before on the cotnarry behind browsing through some of the send I realized it’s new to me. Anyhow, I’m positively happy I set up it and I’ll live bookmarking and checking back frequently! I think other web site proprietors shluod take this site as an model, very clean and magnificent user genial style and design, let alone the content. You are an expert in this topic!